My friend sent me this post. Reading it was a form of confirmation bias. It was as if I was reading what I’d been subconsciously (or consciously? How do you tell?) doing the past 2-years. I’m in between step 4 and 5. It started with creating my own AI Masters Degree. That turned into a job as a machine learning engineer. And the creating hasn’t stopped. Publishing work online has opened more doors for more me than any of my previous ventures. I haven’t figured out 6 yet. But it’ll come. In the meantime, I’ll keep making. Enough about me. What can you take away from this? The post already says enough. I won’t repeat any of it. But I can add a lesson or two. It’s not for everyone. The traditional paths are there for a reason. They’ve stood the test of time. They work for some but not for others. When I was younger I thought I’d be a TV star one day. My mum took me to an audition for an advertisement company. I was nervous but I liked being the centre of attention. After the audition we never heard back. Dreams shattered. Then one day my mum found out the company went broke. I was 10. 10-year-olds don’t understand companies going broke. Why wasn’t I going to be a TV star? Everywhere I went I felt like a combination of special and the one who didn’t fit in. I liked that. Maybe everyone feels it? Probably. Aghh. Enough about me. That’s a 2 count. When you pick your own path, you’ll have people questioning what you’re doing. You’ll get advice from all angles. But there will be something inside of you telling you to push forward. You can’t explain it. When you try to tell someone else, they might get it, they might not. All the advice they give comes from a kind place but they’re not in your head. They don’t have to lay in bed at night with your thoughts. They don’t have to sit down at lunchtime and stare out the window with the feeling in your gut of the thing that’s pulling you. Then you do it. You make the decision you’ve had sitting in your brain your body your soul. And it happens. The whole universe starts getting behind you. But it doesn’t make it any easier. You’ll keep coming up against obstacles keep questioning. Is this the right thing? Yes, maybe, no, it doesn’t exist, all valid answers. Choosing yourself is a daily practice. You make the decision. Then you follow up with the effort. Then tomorrow happens. And you repeat. The internet is amazing. It has lowered the barrier to entry to education, to creating, to making, to sharing, to meeting, to finding. You know this. But it’s not perfect. You know this too. You can learn from the best in the world and then remix their ideas with yours and share them. Others can find your work and learn from it and do the same. The snowball gets bigger. The one thing the technology hasn’t replicated yet is the feeling of connection. Online communities are everywhere but they’re not the same as sitting down at a table with like-minded people. The message meant well and I thanked the person for the kind words. But I’m not self-made. There’s no such thing as self-made. This one is an asterisk on the end of the ‘2 Year Self Apprenticeship*’. *Take advantage of the online resources available to you. But don’t forget about your offline relationships. An offline relationship can be completely online but it takes more than the odd like to convey it. Interact with those who are in your circle. Message the people whose work you enjoy, share it and say why you like it. These kind of acts are what keep the snowball growing. I’m a firm believer the best mentor is someone who is a few years in front of you. And it has nothing to do with age. It’s got to do with mission. What do you want to achieve in the next 3-5 years? If you’re looking for advice, you should look for people who have been through a similar journey in a similar timeframe. Any longer than a few years in front and the advice gets hazy. How well do you remember the details of your day-to-day 6-years ago? Or longer? Over the past 6-7 years, Sam Ovens has built a $30 million per year business. At the time of writing he’s 29. I’m 25. In his latest video, he shares some of the things he has been thinking about. To make sure they sink in, I’ve summarised them in my own words here. Before the internet, the balance used to be, spend 80% of your time shouting about how good your product is (sales and marketing) and 20% actually building a good product. Now, your product is discoverable. If it’s good, people will search for it. People will talk about it. Spend 80% of your time making your product or service better and 20% telling people about it. Don’t be confused by page views or likes or any other metric which doesn’t relate to improving your business. Business school be summed up in one sentence. That’s it. That’s all you have to do. If your product or service brings more value to someone than your competition, you will win. At the start, your business can be all you. You can be 100% of the talent. You can do 100% of the tasks. But as you go, if you want to expand, you’ll have to recruit help. If it’s only you, you’ll be beaten as soon as someone hires a couple of talented people to work on the same thing. If you want your business to grow beyond solopreneur status, don’t be the only talented person on your team. Team will always be the most valuable asset you can build. Intelligence is like horsepower. Useless on its own but powerful when applied. Looking for someone with a specific set of skills may be more difficult than finding someone who already has a great foundation of intelligence and then enabling them to apply it. The world is changing. Always. This is the only guarantee in business. What got you to where you are last year, might not even move the needle next year. Unorthodox people question the status quo. They ask why. They’re not afraid to have strong opinions and back them up. They’re the ones who are willing to try something different. Business is competition. Even if you tell yourself it isn’t, you’ll be competing against someone. Another business, a changing world or most importantly, yourself. Athletes understand competition. They thrive in it. Combine these three and you have yourself a recipe for a potential great hire. Google, Amazon, Facebook, Apple, Microsoft, all the rest. These companies are all looking for the best talent. If you’re a small business, it can be hard to convince someone to come and work for you to begin with. Add in the billions of dollars and brand power of the companies above and you’ve got a David vs. Goliath problem. If your number 1 focus is recruiting a great team, what do you think theirs is? So how do you win? In the movie Moneyball, there’s a baseball team who doesn’t have the budget of some of the other teams in the league. Instead of trying to go for all the best players, the ones with high batting averages and great pitching, they look at the other stats. Their analyst looks through the league, combing for players who don’t necessarily cut it for the big contracts but are on the fringe. The team ends up winning a record number of games straight with only a portion the budget of the bigger teams. Find the people whose talents haven’t yet been fully discovered. Then when they come on board, get out of their way and empower them to use them. Note: This is hard. Really hard. Hence why if you’re looking to expand your business, you should be dedicating a lot of time to recruitment (80-90% in Sam’s case). The quote above isn’t word for word. But it’s what I remember. Thousands of people collaborated to build the pyramids. An effort which spanned decades. When you’re starting out, your focus should be on short-term cashflow. Earning enough money to keep your business going and growing. But as you reach a stage where the business can sustain itself without too high of a focus on short-term cash flow, if you want to build something of pyramid status, your focus should shift to the long term. This all comes back to having a strong team and continually bringing value to the most important people. Your customers. I find it invaluable to have these kind of lessons being shared so accessibly. You can watch the full video on Sam Ovens’s YouTube channel. YouTube comments are usually the source of the deepest cynicism on the internet. But sometimes they’re pure wisdom. I found one the other day which went like this. Instead of chasing financial freedom, find three hobbies you love. One to make you money. One to keep you in shape. You walk in. Henry's there too. There's a grey table in between you and the lady in the grey t-shirt. Sandra. You remembered her name. She's the one who invited you in for an interview. You met Henry in the lobby. You're both going for the same role. Henry's a nice guy. Really nice. He's like you. You're even into the same things. You glance over at Henry. War has been declared. Not really but it might as well be. If getting hired was the goal, there has to be a winner and a loser. You remember talking to Henry in the lobby. Henry was telling you about the web application he'd been working on. You could even start using it on your phone. It wasn't much but it was there. The yellow symbols on the screen were cafes which served gluten-free meals. Henry's girlfriend couldn't eat gluten so he built it for her. 'How'd you do that?' you asked. You glance back over at Henry. The war has been lost. The interview went for another 15-minutes. Some standard questions. Henry talked about how he struggled with his app. Sandra was interested the whole time. Sandra calls out as she ushers you and Henry out the door. Henry turns towards you and stretches out his hand. The email comes a couple of days later. You know what it says. You smile. You knew it. You knew it from the time Henry told you what he'd been working on. You knew it from the time you read the blog post on how to prepare for your first interview. I call this the weekend project principle. Most employers (the good ones) will put more emphasis on the things you've done rather than the things you're capable of. Certificates are great. They're a form of a proof of work. But the weekend project principle is better. The weekend project principle is working on anything you can say, 'I'm working on X' or 'I built this.' And then being able to tell a story about it. Do the courses on Coursera and edX, get the certificates, get the skills but more importantly, use them as a foundation to make something. Six weeks pass. You took Sandra's advice. You decide to send through an email. The next morning your phone starts ringing. It's Sandra. In French, amateur means love. A person who loves what they're working on. But you know it means elsewhere. The rookie. The beginner. The one who doesn't know much. It's easy to be afraid to share your work because you think it fits this form of the word. It's easy to forget an expert doesn't start out as an expert. They had to begin somewhere. And it's dangerous if an expert ever forgets how to be an amateur. Forgets how to see the world through the eyes of a beginner. While the expert is busy trying to do things how they've always been done, the amateur is figuring out how not to do things. Soon enough, they'll realise the way it's always been done eventually becomes wrong too. As always, the value is in the crossover. Being an expert and an amateur at the same time. Having a foundation of knowledge of the world but still looking at everything through the eyes of love. It's okay if you're not an expert yet. In the meantime, you can strive to be comfortable being an amateur (the French version) forever. I haven't had to update my resume for a while. When I started at Max Kelsen, I never sent in a resume. And when I applied for a teaching role at DataCamp, instead of attaching a resume form, I typed a few sentences about my recent and relevant experiences. 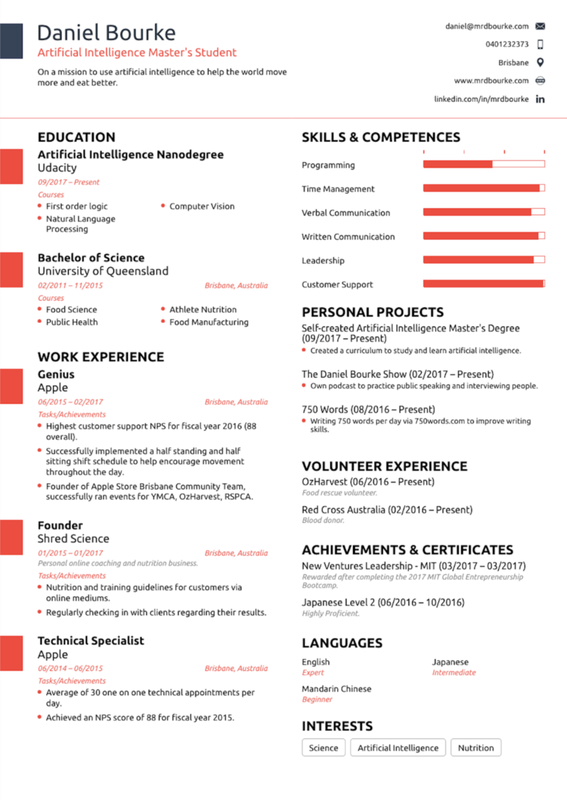 I've never been a fan of resumes. I found them hard to write and always wanted to put more than was necessary. And more importantly, an A4 sheet of paper is hardly the best way to evaluate someone's abilities. But for some roles, like the one my brother is applying for, they're required. So how do you make a good one? No more than one page. Respect the time of the person who's going to be reading it. Anything more than a page is overkill. If you've got plenty of experience, cut out what's not related to the role you're applying for. Keep it short. If you don't have much experience, list other projects you've worked on. If you haven't worked on other projects, start working on some other projects or be honest about where you're at in a custom cover letter. This is obvious. Don't list anything you wouldn't be able to talk about in length during an interview. If you haven't got the relevant experience, address it, address how you would handle it, address what you're going to do about it (see the bottom of 2). Not good: Worked with customers every day. Good: Served an average of 3000 customers per quarter with an 88 NPS score. Not good: Worked on data science projects. Good: Built a data science pipeline which saved a clients business an average of $10,000 per month in 6-weeks. What have you worked on? Include the details. 2-3 dot points per major experience. 5. What are you interested in? Some are on the fence about this. But I'm for it. You can make your own decision. Add a little human to it. What's been getting you excited lately? What's something non-role related you've been enjoying? After all, if you're successful, there's a chance you will have to spend time with the people who are reading your resume. Give to a reason to want to know more. This could be under a hobbies/interest section. Or in a custom cover letter. 6. No spelling mistakes. Ever. Modern resume filters will discard anything with a mistake. When you think it's ready to send off, read it again. Show it to a friend to read. Read it out loud. Does it make sense? Use a tool like Grammarly to make sure your words are spelled correctly and are in order. Have a presence online. A website, a blog, a portfolio, a GitHub account, a LinkedIn, a place to see that project you've worked on. You don't need them all but at least 2 would be good. I don't plan on ever having to send another resume to someone, I've got a full LinkedIn for that. Or if they want to know a little more, I'm not hard to find online. In a resume filtering world, having the little bit extra is what will set you apart. My resume is below. You can copy it if you like. It's out of date but it hits the points above. If you're looking for a guide on how to fill a LinkedIn profile, you can copy mine too. It's not the best but it's full of information. Looking for a place to make a resume? If I had to do mine again, I'd go to resume.io, I haven't used it but it looks slick. Otherwise, there's a free template on Google Docs, Josh an I used that to make his. All the best with the next application! My resume for April 2018. Zac emailed me asking a question. Go back to uni and finish the last 18 months of my degree. He just finished an internship and has about 18-months left at university before he finishes his computer science degree. I sat and thought about it for a while. Then replied to the email with some unedited thoughts. And I’m sharing them here, also unedited. Bear in mind, I’ve never been to university to study computer science. Here’s how I see it, I’m gonna write a few thoughts out loud. - Where do you want to be/see yourself in 3-5 years? It sounds like you’re pretty switched on to where your skillset lies (aka, teaching yourself, working on things which interest you). Might be worth having a think about which one better suits the ideal version of you in 3-5 years. Does that ideal version of you require a university degree? Or could that version of you get by without one? - Which one is the most uncomfortable in the short term? I treat short term as anything under 2-3 years (the starting era of the ideal version of yourself). How much of a rush are you in? Could you stick out the 18-months, share your work online through an online portfolio, upskill yourself through various other courses (and jump ahead of others) and come out with a degree AND some extra skills. This is countering the above point. If you think you have the balls to chase after it (sounds like you already do), why do you need university to be a gatekeeper? Sure, not having an official degree may shut you off from some companies, but to me, a piece a paper never really meant much. Especially when the best quality materials in world are available online. I have a colleague doing a data science masters at UQ and he said he has learned way more since working with Max Kelsen than at university. Put it this way, I was driving Uber this time last year. But I followed through with my curriculum, shared my work online and got found by an awesome company. Whichever path you choose, I can’t emphasis this enough. Make sure people can find you online. If you’re not going to get a degree. Be the person who’s name comes up on others LinkedIn feeds for data science posts. Have some good Medium articles, share what you’ve been doing. It’ll feel weird in the start. Trust me. But then you’ll realise the potential of it. All of sudden, you can become an expert in your field by being the one to communicate the skills you’re learning. What would you do in Zac’s situation? Learn online and look for more work experience? Or stick out the 18-months of computer science?